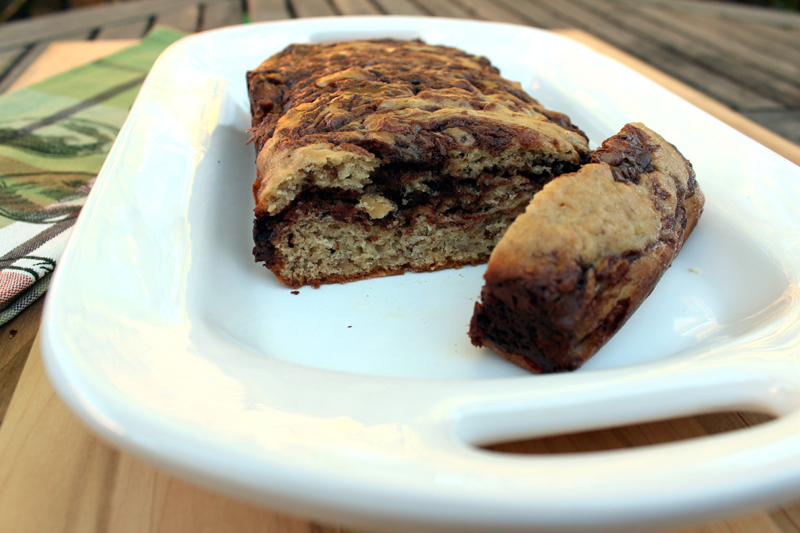 Happiness Project Recipe #21: Sweet Pea’s Nutella Banana Bread! Butter 2 small loaf pans. Line with parchment paper, butter again and then lightly dust with flour, tapping out the excess. In bowl #1 combine the flour, sugar, baking soda and salt. Mix well. In a 2nd large bowl, combine all three well mashed bananas (I use a fork to mash them up nice and good! ), yogurt, eggs, butter and vanilla extract, mix gently. Slowly add the wet mixture (bowl #2) to the dry mixture (bowl #1) and gently stir until all of the flour mixture is absorbed. Your batter will be quite lumpy, but never fear, that’s the way it should be! If using walnuts, fold them into the batter with a wooden spoon or rubber spatula. Next, warm up the Nutella in a microwave safe bowl in two 15 second intervals, until the chocolate is silky smooth. Now, the really messy, fun part! Scoop out half of the banana batter into the two loaf pans, divided equally between the two. Spoon out half of the melted Nutella onto the batter in each pan and stir in a circular pattern with a spoon. Pour the rest of the banana batter into each loaf pan, finishing up yet again with another layer of the remaining Nutella chocolate. Pop those 2 pans into the oven and bake for 30-35 minutes until the tops are a lovely golden brown. Just a warning, your house will smell very, very yummy while these lovely loaves are rising. So resist, my friends. Good things come to those who wait =) Once that timer goes off, remove your pans from the oven and let cool on a wire rack for a good 30 minutes before extracting them from their pans. « Happiness Project Recipe #20: Southern Mama Chocolate Coca-Cola Cake!